UNITED NATIONS, July 28 (APP): UN Secretary-General Ban Ki-moon on Thursday joined the rising chorus of appeals to Indonesia’s government to halt the reportedly imminent execution of a number of prisoners, including Pakistan’s Zulfiqar Ali, for alleged drug-related crimes, and urged President Joko Widodo to declare a moratorium on the use of the death penalty. “The United Nations opposes the use of capital punishment in all circumstances,” the secretary-general said in a statement released by his spokesman. 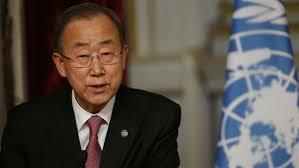 Ban recalled that under international law, the death penalty should be used for thenmost serious crimes and said drug crimes are generally not considered to meet this threshold. The appeal came as Indonesian authorities stepped up preparations for the execution by firing squad of 14 drug convicts.